With Mekong Eyes Explorer cruise, you can travel from Saigon to Phnom Penh covering the distance by boat to explore the fantastic scenery of the Mekong Delta. Along the way you pass fascinating Mekong Delta landscapes with an abundance of rice paddies and fruit orchards, life along the shores, playing children, Buddhist pagodas and colorful Cao Dai temples. In the morning we pick you up at your hotel in Saigon (District 1 and parts of District 3) and take you to your port of embarkation in Can Tho. The transfer takes between 2 to 3.5 hours depending on the embarkation port. After a refreshing welcome drink, we show you our on-board facilities and your cozy cabin. As lunch is served, the boat starts cruising. Sit back and watch the fantastic scenery and the daily life of the Mekong people. In the afternoon you can disembark for a guided leisurely stroll through a village and the surrounding fruit orchards or rice fields. Meet the friendly locals and taste the local produce and fruits. In the afternoon we arrive in the laid back town of Sa Dec for a city tour. There you can see the busy and colorful local market, enjoy a coffee on the nice riverside promenade or visit a nearby flower village with orchards. The charming town still has a lot of colonial architecture, in particular the old market, the church and many old villas and traders’ houses. We visit one of them, a beautifully renovated traditional house of a Chinese trader’s family. This sumptuous building belonged to the main character of the novel „The Lover” and indeed to the lover of Marguerite Duras. In the late afternoon we return to the Mekong Explorer vessel and enjoy a sunset cruise with more fantastic photo opportunities from aboard. The boat arrives Cao Lanh in the morning. After breakfast on the top deck, you can enjoy the the visit to Tan Thuan Dong Islet, which is famous for its orchards full of mangoes, longans, and ambarellas. It is totally off-the-beaten track and rarely visited by tourists. As the boat maneuvering through the scenic Cho Vam Canal, you are invited to a sunset cocktail party on the top deck, which also allows you to fully enjoy one of the most magnificent moments that Mekong river has to offer. After breakfast the tour with Mekong Eyes Explorer ends. For the transfer to Phnom Penh you embark our speedboat for an exciting ride to Cambodia. You pass the first Cambodian style pagodas and a slowly changing landscape from the plains of the delta to a river landscape. A Mekong Eyes guide accompanies our passengers all the way to Phnom Penh to facilitate the immigration procedures into Cambodia and ensure your safe transfer from the jetty in Phnom Penh to your local hotel. Arrival in Phnom Penh around lunchtime. The trip ends here. Please contact us if we can help you organize your tour to Angkor or any further trips. 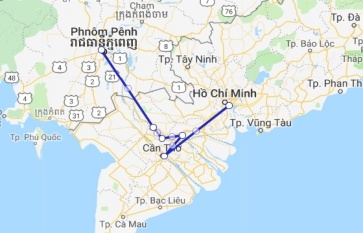 Of course we will also be happy to arrange your transfer to Ha Tien for connecting to Phu Quoc or an excursion to Chau Doc and its fascinating surroundings with Sam Mountain and the magic forest of Tra Su or back to Saigon. We took a 4 day/3 night tour. We were picked up at our hotel in Saigon and delivered to our hotel in Phnom Penh after our trip. I enjoyed every minute of it. A nice break while touring the busy cities of Vietnam and Cambodia. Comfortable, great food, nice people. We could enjoy the luxury of a "private ship" for two nights, which was absolutely lovely! Only 2 cabins on the ship, no tedious waiting for fellow passengers, very personal support, interesting land excursions and a motivated guide. A wonderfully relaxing travel experience! My husband and I, together with our 13-year-old daughter, did the 4-night Mekong cruise aboard Dragon Eyes from 19 Dec to 23 Dec. Cruising the Mekong River is a really worthwhile experience, and gives you a perspective of Vietnamese life that you just don’t get anywhere else. The Mekong is a hive of activity and it was fascinating to watch it from dawn till dusk each day. I never got sick of watching all the boats and seeing how people live along its banks. A highlight for me was seeing villages up close that we wouldn’t have been able to visit otherwise. Love the Mekong Eye Cruise. We cruised the Mekong delta in October. This was the low season.On board there was only 12 tourists. It made for an intimate friendly group where you could sit and talk to people. The hospitality of the staff was excellent. They couldn't do enough for us. The scenery was amazing. The Delta is a busy shipping area from fishing, to dredging, to cruising, to cargo and not to forget the floating market. An exciting trip - which was well worth both the money and time Incredibly exciting ride on the Mekong River, another way to be a tourist in many ways. Good food instructive!